“You dream only about things that you are exposed to”, said Archana Sharma, a senior scientist at the European Organization for Nuclear Research (better known as CERN) laboratory, Switzerland. 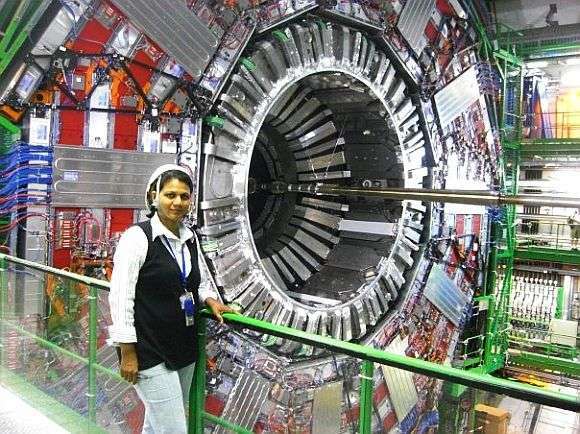 The transition of a young girl who dreamt of being a school teacher while growing up in the small town of Jhansi to a scientist at the mecca of particle physics is a story of hard work, grit, and determination. Archana and her team played a crucial role in the discovery of Higgs Boson by building one of the most sensitive detectors called Compact Muon Solenoid. She is actively involved in science education and outreach and frequently interacts with high school students. Following her passion to create a lasting impact in science education, she established Life Lab, an NGO, in India to connect students and teachers with the global research communities at CERN. Mrinal Shah caught up with Archana for a conversation about her current research, childhood experiences and her plans for science outreach in India. How long have you been working at CERN? While presenting my PhD work at a conference in India in 1987, I got the opportunity to come to CERN and do some data analysis for three months. During this time at CERN, I won another opportunity to stay on at CERN for one year. However, the decision to stay was not taken so easily. My family was in India. I came back to India and had my son in 1988. In 1989, I moved to Geneva with my son and husband for my post-doctoral research for the next four years. I have been here since. You also did a second PhD at the University of Geneva. What was it about? I did my first PhD at Delhi University in nuclear physics. I was quite a good student when I was in India—I had gold medals—but I didn’t learn the instrumentation or how to build tools to study science. In theory, I knew how things should work and how to analyse the data, but I was lost when it came to the practical aspect of nuclear physics. After coming to CERN, I started to do instrumentation along with data analysis. I was in a lab that built gas detectors to look at particles/radiation. This also became my speciality in the end. However, due to my lack of expertise in instrumentation, I decided to get proper training. I registered for a PhD on a class of detectors called ‘drift chambers’. The year I was set to submit my thesis, they changed the rules at Geneva University insisting that every student must take some exams on Theoretical Physics. This was after six years of PhD work in a new area. Having moved from India with a family, I had no idea how I was going to pass these exams, and that too in French! It was a nightmare. I think that’s where my grit came in handy because I said I am going to do it. I got tuition and help from a post-doc. After six months of tuition, I passed my exam and got my degree in 1996. I am very proud of that. That was quite a journey. Do you think this was typical of any foreign student coming to CERN? This is the difference between the so-called first world and third world. Students who come from European countries are very confident and come with a lot of practical experience. They will even know about the different tools that complement the measurements. They are very well trained in instrumentation from schools and colleges. In India, at least then, this was completely lacking. How was your transition from a postdoctoral researcher to being a permanent staff at CERN? What factors do you think helped in this transition? It is an exponential learning curve. Whenever I fell, there was something that I learnt. As I think back, I feel my life is full of little projects, which over time have grown into a whole body of work. By 2001, I had enough work to be called an expert in the field. I started to get invitations to speak in different universities and conferences that really kicked off my career. Because the skill sets that I acquired matched the requirements then at CERN, I got the opportunity to apply for a position in CERN. This was great because until then Indians did not get that opportunity. Of course, when I got the opportunity to get to the interview stage, there was no way I was going to let it go. The first twelve years were rigorous, very gruelling. I had no weekends and I had a child at home. It looked difficult, but I think, if you plan your life well and you have a goal, you will eventually get there. However, when I think back now, I feel I could have done much better. I could have planned better. This is why I want to share my experience with students. You need grit. Talent is just perseverance. I think this understanding sets me apart from other people who also had similar opportunities. What was the first problem that you started working on? I was hired to build large detectors of around 1000 square metre. I was used to building small detectors for so many years, so I was really tense. I even remember crying about it. I was worried about so many things: How will I power the system? How will the electronics work? How will I supply the gas? What if there was a disaster? But I went at it slowly, understanding one thing at a time, and by 2007, I had installed almost 500 detectors. (Left) Archana introduced a new technology in the Compact Muon Solenoid experiment at CERN, the Gas Electron Multiplier. Here, she is with her students and postdocs building the first prototypes. (Right) Archana in her lab. She built a laboratory from scratch and later installed the detectors. What was it like when you first arrived at CERN? Everyone is very approachable. We have discussions all the time; any student can get up and ask for advice whenever they need it. When I first came here, I was very intimidated. It was a cultural shock to even call the scientists by their first names. I used to be scared to sit alone in the cafeteria. I was facing a kind of imposter syndrome. But these days, youngsters come with a lot of confidence. Can you tell us more about your lab and labmates? How big is your lab? There is a lot of teamwork. When I am working on the detectors, it starts with the physics of it, and then the drawing and engineering. Finally, we build them. Starting from the bench to testing, the prototype and installing and commissioning them, I have students with me all along. Some students work on the database and some work on the software to track the detector, so it’s like a bootstrap process—everyone contributes! I love that environment. My lab is rather big because of the size of the detectors that we are building. I have a staff of around 20 and the whole collaboration consists of about 300 people. I have had about 20 PhD students from 2001 till now. I have also worked with a lot of high school students, which is fun! What was your role in the discovery of Higgs boson? You need a huge amount of resources to prove the existence of Higgs boson. The Large Hadron Collider accelerates the protons at very high velocities and makes them collide. We need trillions of electron volts to create energy high enough to create Higgs boson. The probability of creating a Higgs will be high only when the energy of the proton is high. Just the making of this machine costs one billion dollars. So, you can’t build a prototype! You must go slow, testing everything. We need detectors to ‘see’ these particles, and they must be really huge—as big as six-storeyed buildings. Imagine this: Millions of mobile phones are stacked together and each one is taking a picture. We have to sift through all these pictures to find the Higgs Boson. This was something like that! I am—actually we are—involved in building detectors that could detect a muon (another elementary particle) that tells you that a Higgs was produced. If you love what you are doing, you can barely sleep. And I am really lucky. It was a lot of fun… building objects weighing 2000 tonnes, lowering them underground, commissioning them and installing them under the camera in presence of media… every step is exciting. That’s a really large structure. Do you have any interesting memories of these installations? Oh yes! We had to install some detectors at a height of 25 meters. You need to go on mobile elevated platforms and I decided to do one such installation. I first had to take a theory test, which I passed. Then came the practical part. After starting the machine, I realised it was not so simple. One has to be very careful, moving the platform slowly and angling it in the right position. I was scared—if something goes wrong, the detector could be damaged and that would be a huge loss, but if I gave up at that point, I would be embarrassed. Anyway, I finally did it. I was happy. Archana with the Compact Muon Solenoid Experiment in the background. The central part of the detector is seen. Did you ever have Aha! moments in your research? Sometimes they come every day and other times, we have them once a decade. We meet challenges, solve them and move forward. If we wait for the Aha! moment, it’s very difficult to move forward. For Higgs boson, it was like a hunt, as if some detective work was going on, so it was very exciting. In one second, the Large Hadron Collider gives us data that telecom gives the world in one year. It’s a lot of data. We need to have the complete pattern recognition systems ready so that when data comes out we can catch it. Every day we make sure that we don’t miss anything. The probability of finding the Higgs boson is like finding one extra special golden sand grain in the beaches of Goa. Apart from enabling the discovery of fundamental particles, what are the other applications of these detectors? These detectors can be applied in many different fields. For example, in medical science, these detectors can reduce the dose of X-rays by 200 times. They can also help in the study of rocks by detecting the background radiation. In the first twelve years, I had the opportunity to innovate. We tried a lot of different ideas and our group has a good number of patents. In my career, if I am able to see some applications of my work, that will be fantastic. What is it like being a woman scientist at CERN? To be taken seriously and to overcome a stereotype, one has to work very hard initially. There were so many instances of people saying, ‘Ah, you must be a secretary or a translator’, especially in my early days. However, I do think things have changed a lot since. Of the total scientists at CERN, 20% are women but the number has remained constant over the years. Women here do not hesitate to speak their mind. It took me time to learn this. I always thought of myself as second class. I had to make a very big effort to come out of my shell. I can only imagine how difficult it must be for someone who does not have role models around them. I loved my school and my teachers. They were geniuses in handling children. They motivated us so much and really pushed us in the direction of learning. My science teacher was particularly amazing. She used to do experiments in class. She used to do funny things. She once brought a little blade in the class and pricked her finger and showed us—“Look this is how blood comes out because of blood pressure”. Whenever I am in Jhansi, I make sure to visit my school. Both my parents were teachers. My father taught mechanical engineering and my mother taught economics and geography. They were very strict and rigorous. My father would wake us up at 5 AM by sliding us from the charpoy. We lived in Jhansi and it was very hot. If you don’t wake up in the morning, you won’t have enough cool weather to study. I wanted to be the best teacher in my school. Childhood teachers are your role models and you want to be like them. I am happy that life has come a full circle because I am slowly becoming a teacher. What are your impressions of your higher education? How do you think it moulded you? I went to Banaras Hindu University (BHU) for my undergraduate studies and that changed my learning. My physics teachers were really good and so I started getting curious about the subject. I started enjoying the process of understanding why and how things work. During my masters in physics, again at BHU, I got hooked to nuclear physics. Nuclear physics was like having a ball, cutting it open and studying it to its bare minimum, and the game is still not over. There was a vacancy announcement in Delhi University and I started my PhD there with a scholarship of Rs 600/month. For the first time, I interacted with researchers from other countries. It was also the first time that I realised that I liked research. 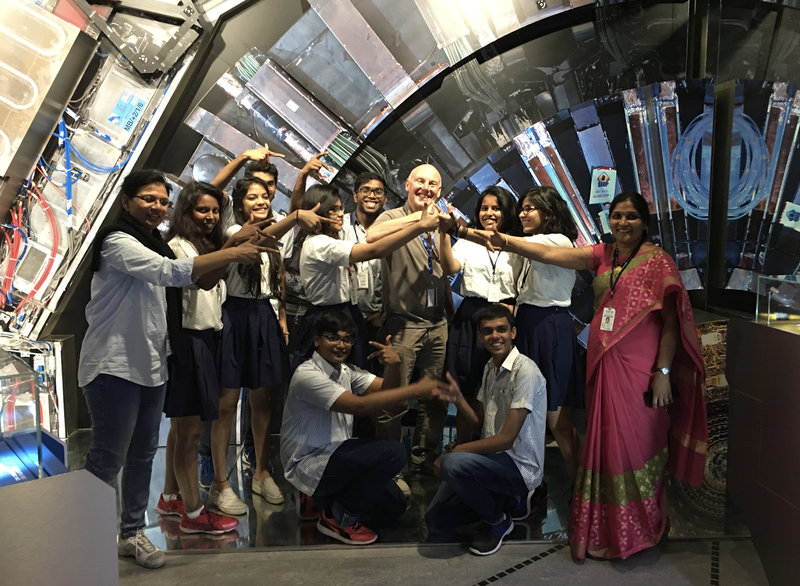 Archana with students and teachers from India at Microcosm, an exhibition at CERN. You are actively involved in science outreach. Tell us about Life Lab foundation. I was frequently invited to give talks in schools and colleges in India. However, I wanted to go beyond this and bring about a lasting impact. That’s how Life Lab was born. We select students and teachers to visit research facilities, learn from international experts and understand the technology and engineering at live experiment sites. This knowledge is shared with other students and teachers in their communities through exhibitions and workshops. I am in the position of such privilege that it would be a shame if I don’t use it for the benefit of my country. Really very well conducted interview which will definitely do justice to the main objective of motivating students in research work…. Really inspiring interview Dr Archana . You have touched many hearts and motivated young minds towards STEM education. Salute your passion. Keep up the good work.